When a man stands with his feet fairly wide apart his weight and balance will be evenly spread. The idea of this throw is to take one leg away suddenly causing him to fall over. This is not so easy as it sounds. A man sensing that you are going to reap one of his legs away will either close his legs or shift his weight to his other leg. The essence of this throw is to catch him with his legs spread wide and in the actual execution of the throw make sure that his weight is mostly over the leg you are hooking away. Stand in the natural posture with your partner bracing backwards with his legs spread wide. We will assume for the minute that you have got your opponent into such a position. As you stand now it is not possible to stretch out your right leg to hook the inside of his. Starting with the right foot take a short pace forward followed by a similar short step with the left. This will bring you in closer and within range. Stretch out your right leg and with the back of your heel and lower calf sweep round in a small circle until you hit and reap away the opponent's left leg. With your right hand which is holding the collar, bear down with all your weight over the leg you are taking away. Your left hand should contribute to this action by pushing your opponent's arm and upper body in the same direction. One important point to remember is the direction of the throw. You are throwing your partner backwards and down. This means that when you are actually doing the throw you should be moving in those directions too (forward and down). If you are very fast and catch your man completely on the hop with his legs spread wide he will collapse backwards instantly. This is not often possible. 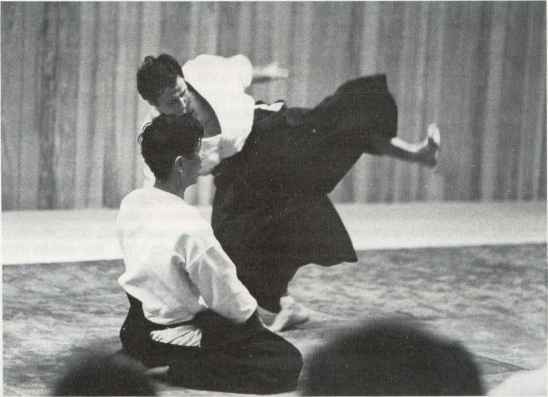 It is usually necessary to complete the technique by bearing down on the opponent's left shoulder all the way to the mat. It is not necessary to fall on the opponent. Your hands still holding your partner's jacket pin him to the ground and should be used for preventing your body crushing into his. Note the position of my head and right shoulder. After I have got the man toppling backwards it is necessary to guard against an effective counter for this throw. To do this I swing my head and shoulders round my right. Compare this position with the starting position for the throw. Getting a man to spread his legs is not so difficult. If you attack strongly several times with a forward throw - a hip throw for example - the man will start to brace back and spread his legs. 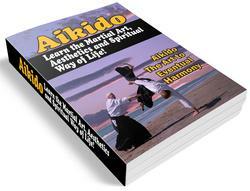 A sudden swift change of direction using o-uchi-gari will be effective. Another example is when you try pulling the man forward. If he resists this movement he will usually start pulling back with legs spread wide in the manner of a tug-of-war. Once again a sudden change to o-uchi-gari should succeed. There are many other opportunities when your opponent is moving round the mat. Every time he steps with his left leg he is spreading his legs. Try with a subtle pull to make him step a little further forwards or to the side. Then attack with o-uchi-gari. This throw is very useful for breaking up a defensive position. It is possible to attack several times in quick succession with it which should at least make your man stagger. Depending on what reactions you get it is then easy to come crashing ni with some other throw. One last point. When you hook your opponents leg do not lift it up. If you do this you are supporting him to a certain extent. The idea of the throw is to take away his support. Aim to keep your reaping foot fairly close to the mat. A similar throw against this wide leg stance is to use the right leg and foot against the opponent's right leg. This means shifting his weight over his right leg. This is called ko-uchi-gari.